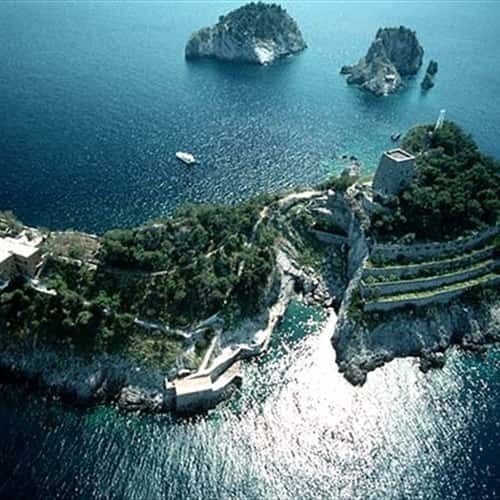 Li Galli islands, the three rocky and lonely islands (Gallo Lungo, Castelluccio and Rotonda) located a few miles from the beach of Positano, mirror themselves in the limpid sea facing the pearl of the Amalfi coast. According to old legends, they were inhabited by the sirenes who seduced sailors with their melodious voice: they lost control of their ships that inevitably crashed on the rocks of the islands (this is a clear transposition in a mythological key of the dangers during the navigation). In the Odyssey, Homer tells us that Odysseus blocked his men's ears with beeswax, and made them tie him to the foot of the mast so he could not be drawn away by the lure of the Sirens' song. Already Strabo, a Greek geographer of the I century b.C., identified this three small islands as the Sirens' seat, calling them "Sirenai" or "Sirenussai". In 1131 they were called "Guallo" and in 1225 Federico II Swabian donate this archipelago to the monastery of Positano ("tres Sirenas quae dicitur Gallus"). The place name brings to mind the ancient Greek iconography, wich represented the sirens as a birdd with human face and not as a being half human and half fish as the Medieval tradition suggests us. Periodically visited by Tiberius, protected by the Angevins with the Tower for dissuading raiders to take refuge on it, the last inhabitants of these isles having their own natural charm, have been the choreographer Leonide Massine (who built here a wonderful villa, on the ruins of an ancient Roman villa, subsequently decorated by the architect Le Corbusier) and the ballet dancer Rudolph Nureyev.